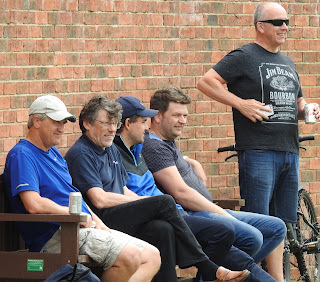 Attenborough Cricket Club: Full weekend report - incl. Kimber and 'Baz' Alam (player of the season so far) lead the way! Full weekend report - incl. Kimber and 'Baz' Alam (player of the season so far) lead the way! This weekend there are only 2 games to report on as the grounds were heavily affected by poor weather leading up to gametime for the Saturday 2nds, 3rds and 4ths. To begin, the 1sts were home to Radcliffe-on-Trent with their intentions clear... bounce back from last weekend and pick up maximum (20) points. Captain Steve won the toss and elected to field as the conditions looked to suit the bowlers first up. Ben Bhabra and George 'GB' Barker who was bowling his first spell in the Premier League opened the bowling. They were magnificent picking up 3 of the top 4 batsmen with the ball moving sideways as George dismissed both of the openers in a spell I am sure he will never forget (7-2-16-2). In addition, there was a little GB fan club forming on the boundary who were proud of their very own performing on the biggest stage. 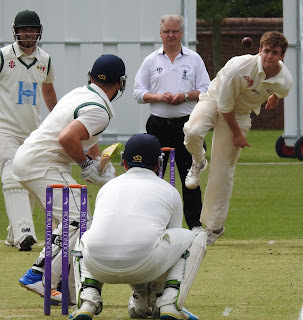 It was then left to the spin attack led by Louis Kimber who picked up 3 wickets in a fantastic spell (9-3-26-3) to bowl out the opposition for 106 inside 36 overs. Another highlight from the first half of the game was Craig Heiden taking an acrobatic, breathtaking catch at point to dismiss their dangerman off Pete Bhabra's bowling (7-0-26-2). Steve (29, 3 fours) and Burhan 'Baz' Alam opened up the batting reaching 62 for no loss. Unfortunately, Steve was dismissed after hitting some lovely boundaries but Baz stuck in against some tough, economical bowling. Baz was later dismissed for 37 (110 balls, 3 fours) but again showed his technical ability and willingness to adapt according to the game situation. The 1sts won by 6 wickets and picked up 20 points. Great team performance in front of many supporters at the home of cricket, The Strand. Full scorecard here. The second game was Raino's T20 side travelling to Caythorpe with their unbeaten streak on the line. Attenborough batted first and were bowled out for 113 on the last ball of the innings as Baz top scored again with 34 and he was well supported by Neil Thurlow who made 28. This score looked quite below par however it was defended (just!) as the Squirrels won by 2 runs. There were wickets for Will Shields, Ben Bhabra, Tauseef Kataria, Seth Puddy and captain Martin. Also, Lucas Stentiford continued to impress behind the stumps contributing to 2 dismissals. Undefeated and continuing to impress. Full scorecard here.